Welcome to another postcard from dangerous places. A lot of what I post is somewhat banal, everyday material about the kind of stories that wouldn’t make it into international news. But these everyday events are the bricks that make the houses of our lives. I find that in this increasingly-homogenised world, it’s the little differences that make travel so interesting. And while Papua New Guinea may not be on the top of most people’s travel to do lists, it certainly does have in its favour that it is unlike any other tourist destination on earth. No McDonald’s. No Starbucks. No Pizza Hut. No KFC. It’s primitive as can be. But that makes this place a lot more interesting than many destinations. In the news this week was a story about “compensation” is used in the Highlands (and elsewhere) as an informal Torts system. Rather than suing people in courts, the victims of an accident negotiate compensation from the offending party. In this case a woman was killed and her village was compensated 100,000 kina (about $40,000) plus 60 pigs. That’s a lot of money. Pigs are expensive here. A child was also injured in the accident and paralysed. The compensation for that was 60,000 kina and 30 pigs. A couple of big name Rugby League players were in town last week for a fund-raising event. 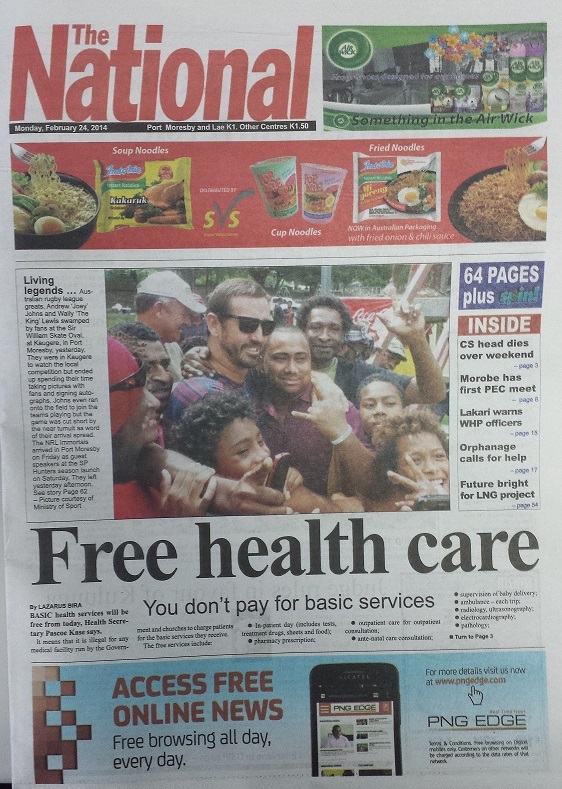 Oh yeah and PNG has free health care. The standard varies a lot but it’s true that people here don’t have to pay to see a doctor. Now if only the USA could match that. 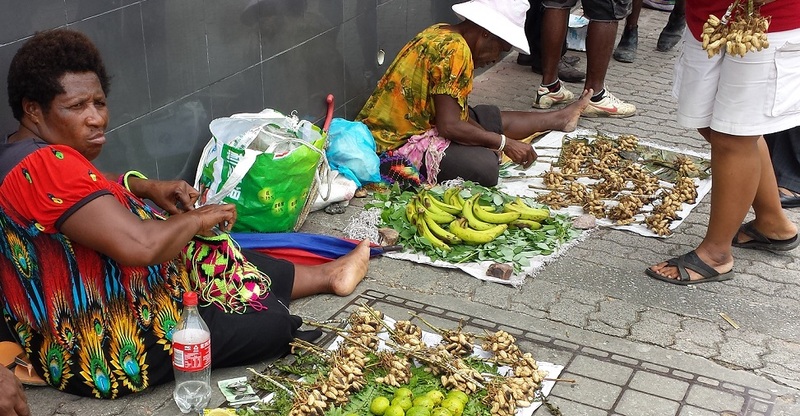 Betel nut (buai as they call it here) is now illegal to bring into the city of Port Moresby. The ban came into effect late last year. This is a wonderful development because the city is no longer covered in people’s disgusting red spit that spreads tuberculosis. The impact on the city has been immediate and is most welcome. 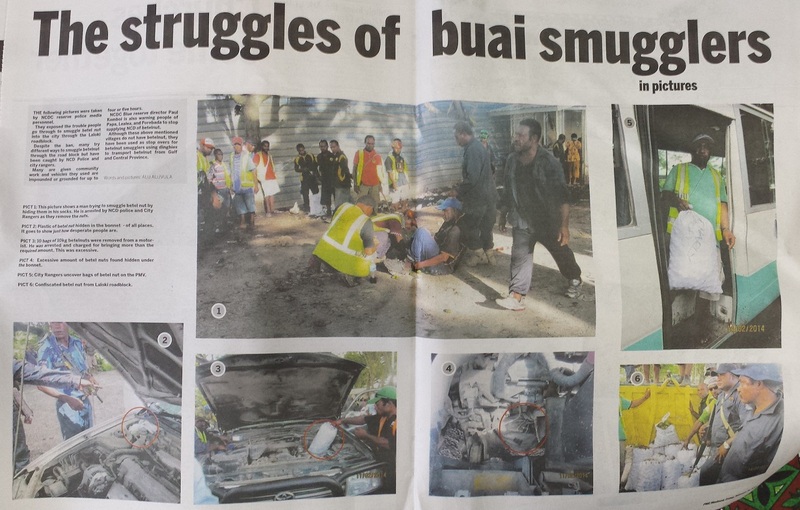 It has, however, spawned an illegal smuggling crime spree with people being arrested for trafficking the drug into the city. At least two people have drowned trying to sneak past the checkpoints by swimming across a swollen river. The impact is clear to see throughout the town. 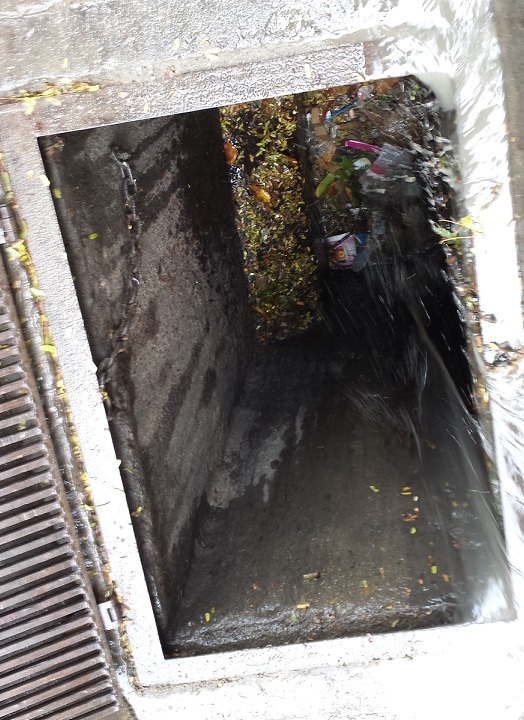 This stormwater drain used to be constantly filled with the husks of discarded betelnuts and stained red by the foul saliva that people spat down there. It had to be cleared out about once a fortnight by some unfortunate fellow with a shovel. Now, it stays clear most of the time. It’s available to collect storm water instead of being used as a rubbish bin. I’m generally a very liberal-minded person when it comes to prohibition. But it’s very different when the evil habits of one person adversely affect everyone around them. So I am very much in support of the betelnut ban. The 2015 Pacific Games build up continues here in Port Moresby, with construction of sporting venues taking place at various locations around the city. 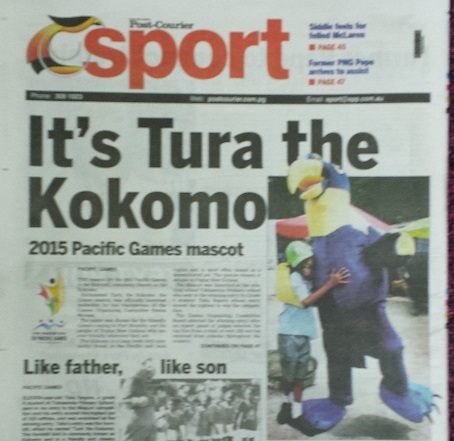 The mascot for the game was revealed recently – Tura the Kokomo. As I walk through town to buy a coffee in the mornings I am usually greeted by a handful of street vendors selling a range of wares from cigarettes to pineapples. However, I’ve taken a liking to these peanuts that they sell on the street here. They sell them raw but they also dip them briefly into a fire to roast them. The roasted kind are a little nicer tasting but they are so blackened by the fire that I worry about consuming the carcinogens so I usually go for the raw variety. I watched this fellow trying to sell his fish on the street for a minute the other day as I walked by. The fish usually disappear within an hour, so presumably there is a ready market for them. I haven’t been tempted since the fish that I bought about a year ago off the street. It was extremely cheap but it’s hard work butchering a large fish like that. One of the more unusual items for sale on the street last week was this puppy. The vendor caught my attention by commenting that it has blue eyes. “Blue-eyed dog” she said. I thought she was speaking figuratively. But sure enough, the dog actually had blue eyes. I didn’t buy the puppy. Dogs smell bad. 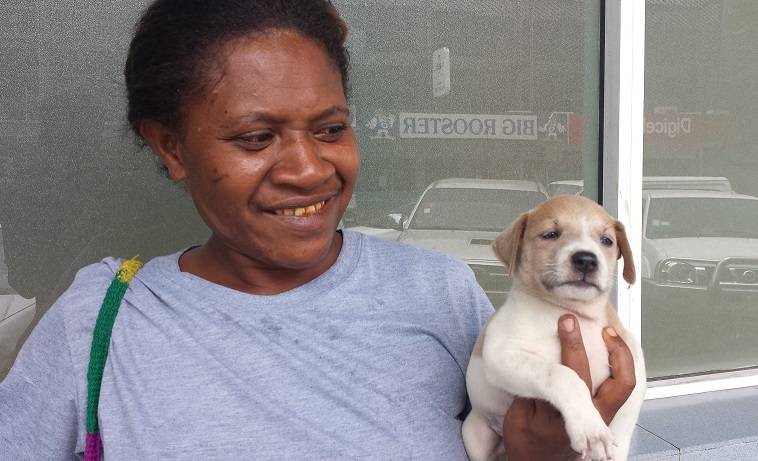 It’s a little puzzling as to why, but there are almost no cats in Port Moresby. It could be that there is a stronger culture of dog ownership (I use the term ownership loosely as most dogs wander freely causing grief). Perhaps with all the dogs running freely it is not an environment that is conducive to cats. 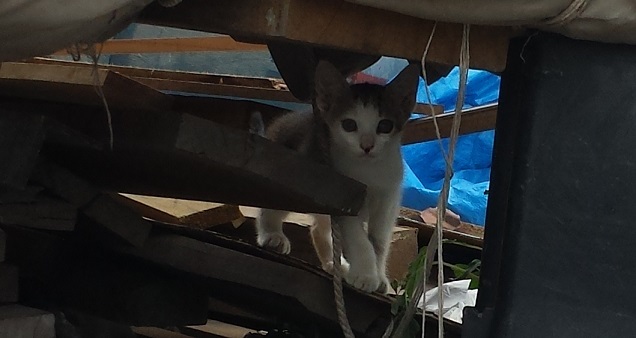 That’s probably why this kitten caught my eye as I was going for a walk the other day. I’m not a cat person either but the kitten was very cute. This photo shows a hole in the footpath that is probably an access point for sewarage or gas pipes. What caught my eye is that it is missing the cover. So it leaves a hole about the size of a human foot right there in the middle of the footpath in one of the busiest parts of town. 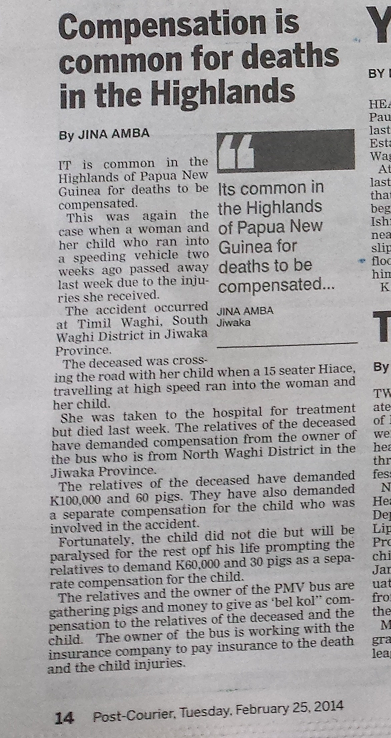 That’s not at all unusual here in PNG – such death traps exist all over the place. But it is highly indicative of a very different culture from the one in which I live. 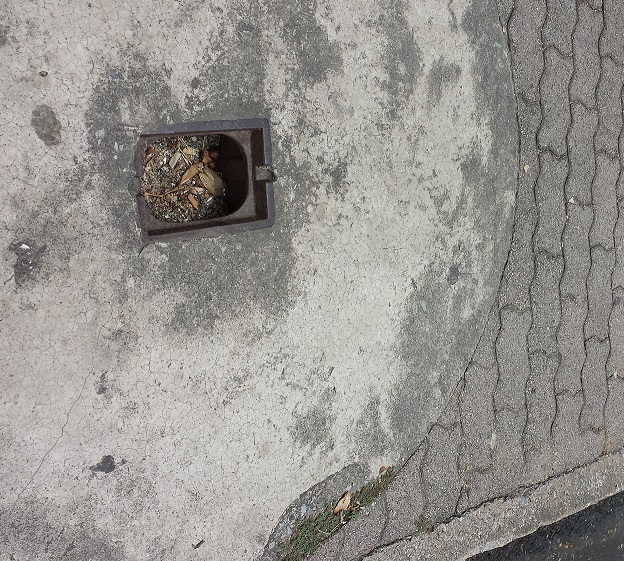 If there were a hole in the footpath like that in a Canadian City, the local Council would immediately send someone out to fix it. In the meantime they would probably leave a supply of colourful warning signs for fear of someone breaking an ankle and suing them for a million dollars. 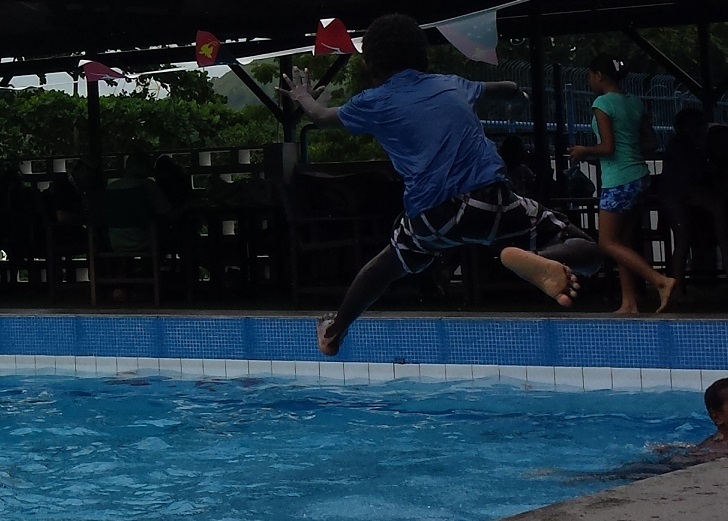 In PNG, the attitude is quite the opposite. Responsibility for preventing injury is shifted squarely back into the hands of the individual. The attitude is not to remove everything dangerous but rather that people should watch where they’re walking. Of course, people don’t and so they are constantly injured in various ways. But I do find it refreshing compared to back home where one is generally immersed in a culture of overly-intrusive governments and “eat your vegetables” legislation. More evidence of the lower ‘duty of care’ practiced here comes from this truck load of garbage. Pieces of debris were bouncing off and dropping all over the road as the truck trundled along unperturbed. 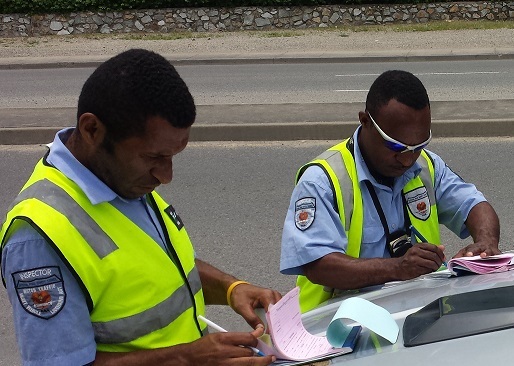 However, one area in which the local government excels is enforcement of registration checks. I don’t know if these chaps work on commission but they are everywhere and they operate very aggressively. A colleague and I were on our way to register a new car that we’d brought in from Japan when we were pulled over. 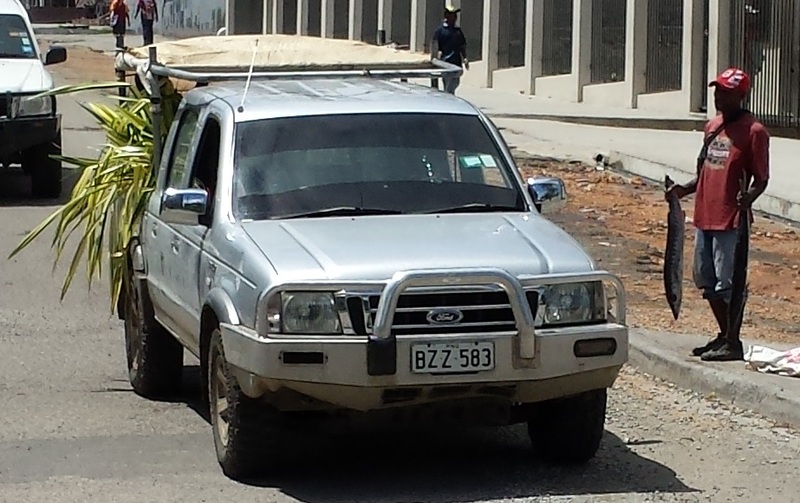 We had been told that we had a week to do the registration, but according to these guys we were supposed to obtain some other permit in order to get to the place where one buys the permits. Generally speaking people here would pay a small bribe to make a problem like this go away. We refused to offer one and they couldn’t write out the tickets fast enough. The total cost was 300 kina, plus five minutes of the guy on the right yelling on me so forcefully that bits of spit were hitting me in the face now and then. I hope he doesn’t have tuberculosis. “To protect and to serve”. 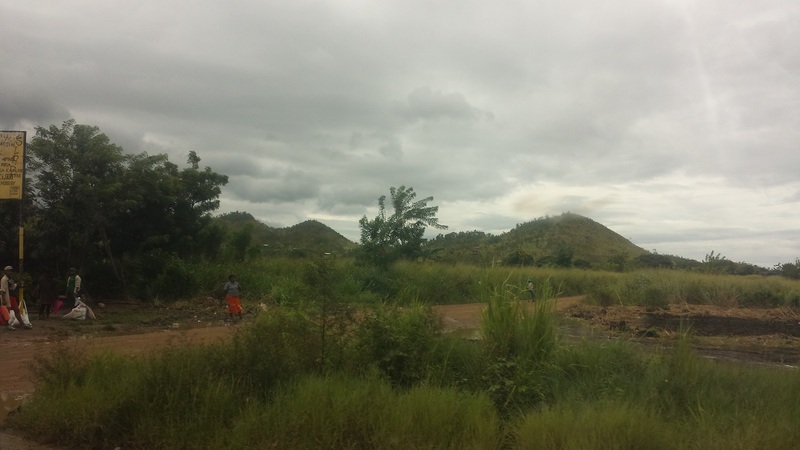 Port Moresby is lovely and green at the moment from all the rain that we’ve had. Ferocious storms blow in, dump an ocean of rain and then blow out a few hours later. The rain cools the place down, which is a pleasant relief. But it does also create lots of puddles in which mosquitoes can breed. I confirmed when I was back in Canada that I did contract Dengue Fever. Despite my mosquito net and all of my efforts to avoid bites, I still get bitten every now and then and one of those bites gave me Dengue. It was a very unpleasant weekend recovery but I have been lucky. Some people suffer horrible rashes and other symptoms that can last for months. Mine passed rapidly. There are five strains of Dengue. The good news is that I am now immune to the strain that I contracted. The bad news is that if I get any of the other 4 strains, the symptoms will be more severe. So vigilance continues to be the order of the day. One of the more challenging elements of life in Papua New Guinea is shopping. Nothing is ever easy to obtain. Things are always overpriced and availability is inconsistent. Most people buy cheap Chinese imported goods most of the time. These are cheaper but they are notoriously unreliable. 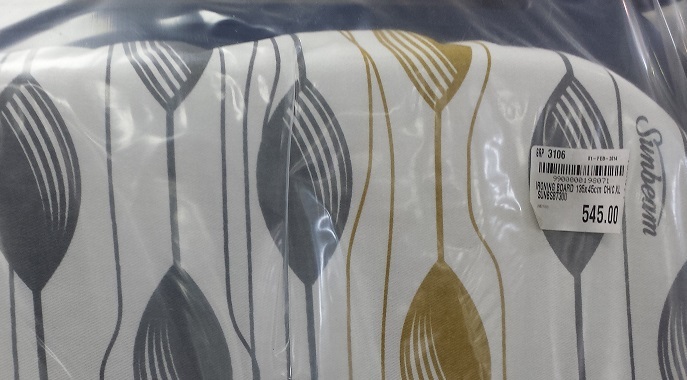 My ironing board that came with the house died recently and I had to replace it. The decent quality boards cost 545 kina, which is about $220 Canadian. Seems reasonable. I generally visit 3 or 4 different supermarkets every week in an attempt to obtain the fruit and vegetables that I like to eat. I went to RH Hypermarket last week, which is normally one of the better supermarkets. But their range was appalling. They had hardly any fruits except for oranges. Evidently, someone ordered too many oranges and since they had no other fruit they just put rows and rows of oranges on the shelves. 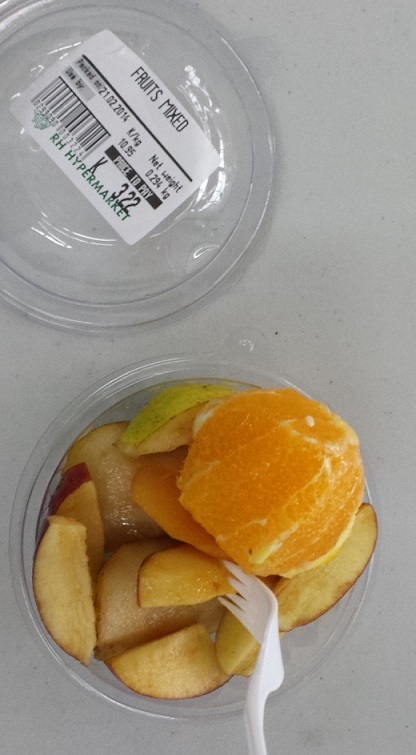 I had a vision of some poor staff member going to the boss and saying, “None of the other fruits came in. The shelves are empty. What should I do?” and the boss replying, “Just put out more oranges”. Everywhere I looked it was wall-to-wall goddam oranges. Not a pineapple in sight. They also sell cups of sliced fruit, which I buy for convenience on occasion. This one had a whole orange in it. Not cut up at all. Just an entire orange. Who does that? They provide a plastic fork to eat it so it seems they figured that I could fit an entire orange in my mouth. 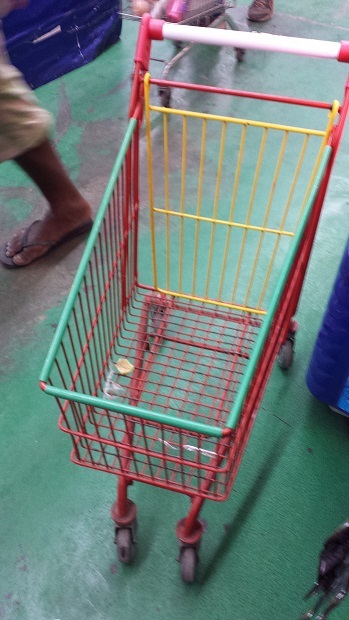 This colourful children’s trolley (cart) surprised me because they can’t keep the adult trolleys in working order half the time so I was not expecting to see such a frivolous item at the supermarket. In a country with so much need it seems strange. But then I guess everyone likes cute little kids’ trolleys. As with most of South-East Asia, fake products abound. Like this Dolce & Gabbana t-shirt for $5. Seems legit. 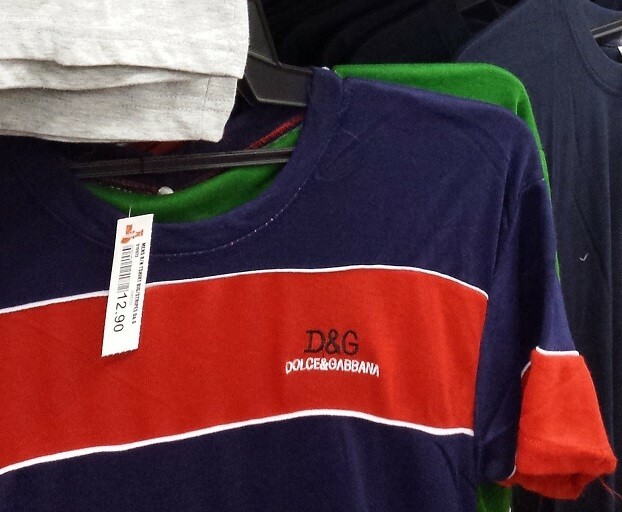 I guess that’s why D&G ended up in an Italian court recently for tax evasion – if all those Papua New Guineans had paid full price for their D&G t-shirts, there would have been no need for them to evade taxes. 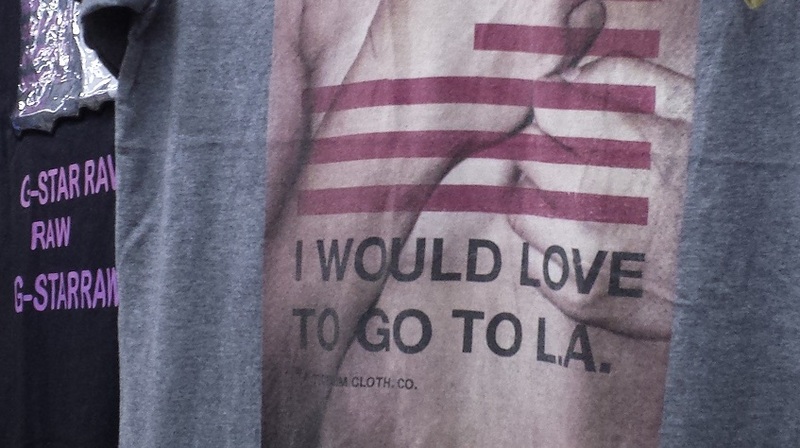 In the fake clothes section, I also saw this t-shirt that reads “I would love to go to LA”. It seemed an odd slogan for a t-shirt but then I realised that this product is marketed to some of the poorest people in the world. I’ve been to LA a few times and I’m going back through there on Friday. To me, LA is no big deal. To the people who buy these shirts, LA is an unattainable goal that will be beyond their reach in their lifetimes. It’s good for me to reminded that I am one of the privileged few people on this planet who moves freely from continent to continent with little thought beyond, “I hope that the on-board menu is good today”. Speaking of menus, a new Indian restaurant opened here recently. It’s called “Tasty Bite”. It’s not often that a new restaurant opens so the expatriates tend to flock there just to try something different. 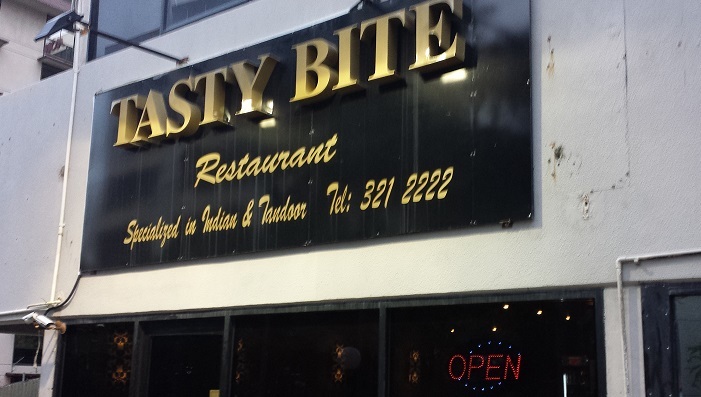 I ate there for the first time last week with some of the Moresby Arts Theatre crowd. The food is quite…tasty. 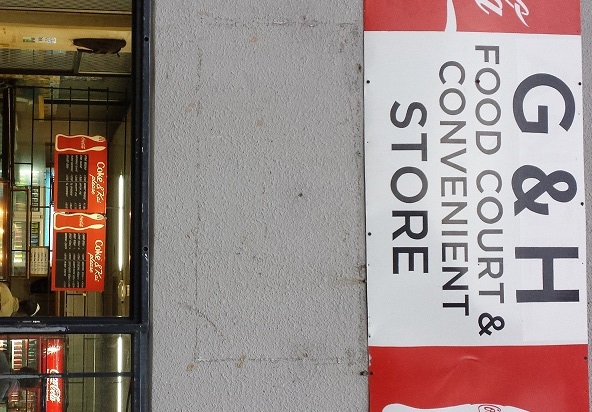 Next door, there is a “Convenient Store”. Some more random tidbits from life in a dangerous place. This car was driving along in front of me with a shredded front tyre the other day. Preventative maintenance is a rare commodity here. It’s very common to see cars getting around with their spare wheels fitted. 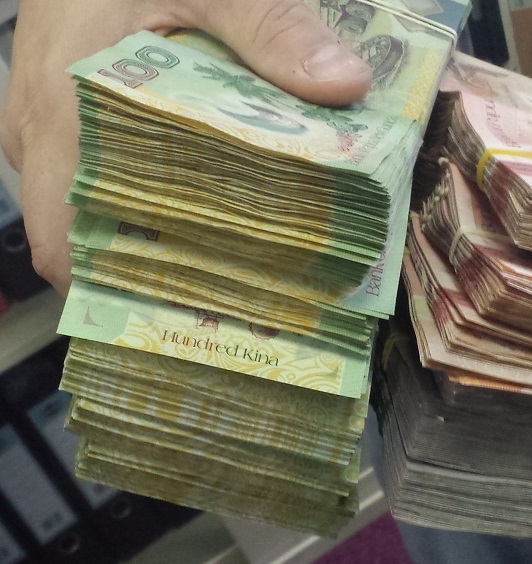 A friend had to distribute a bunch of money to his staff the other day – in cash. I had never seen so many Papua New Guinean bank notes in one place before. 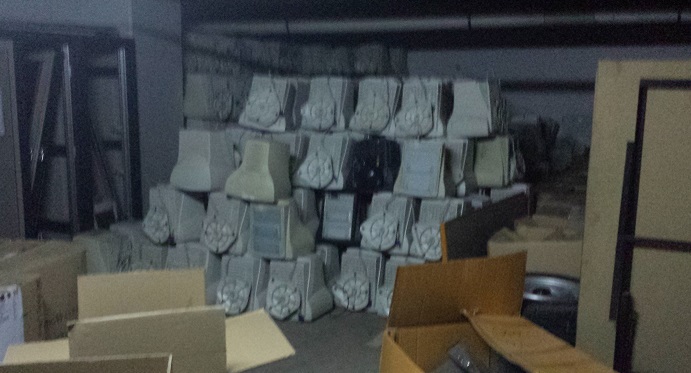 Please don’t send your old CRT computer monitors to the developing world – they don’t want them. This huge pile of old monitors is cluttering a storeroom at the office, waiting for them to go through the disposal process. This large toad was hanging out near my front door the other day. 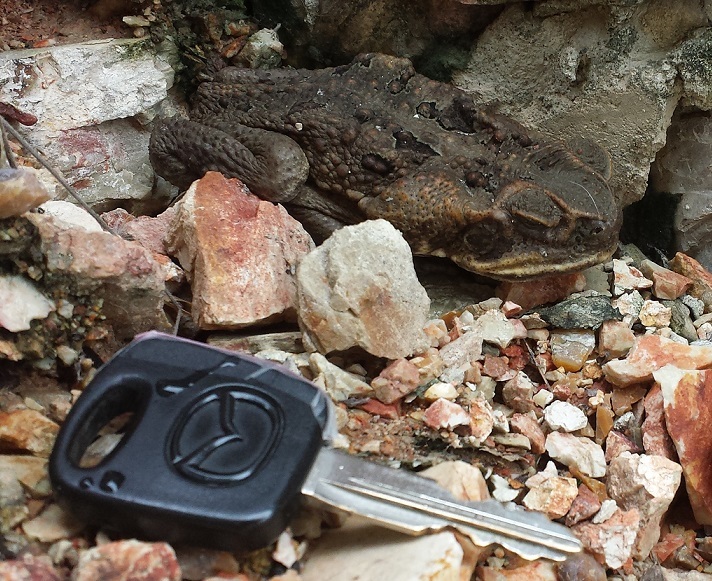 I put a key in the foreground to provide some scale but the toad is bigger than it looks here. It was about 10 centimetres long. For those of you who still use the Imperial system, that’s about 200 inches, I think. 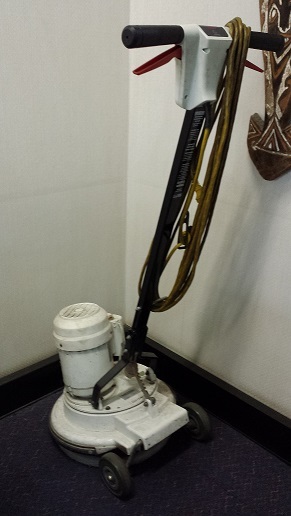 I was in a hotel recently and saw this contraption parked in a corner. I think it’s an early version of a Segway or something. 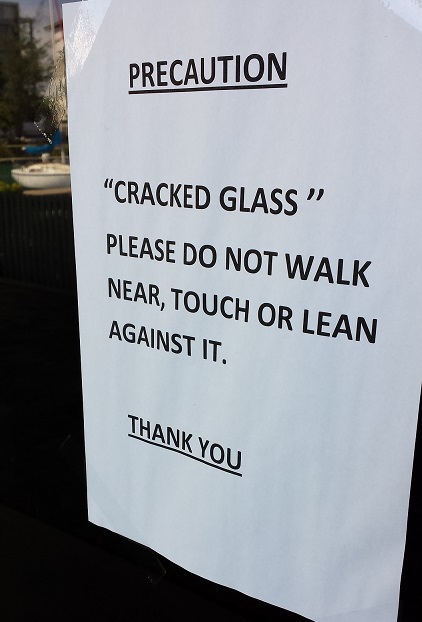 Watch out for the so-called “Cracked Glass” that your mother warned you about. I took a day trip out to the Orchid Gardens for a picnic with friends last weekend. The countryside is so different just outside of the city. I was reminded of the trees that I saw in Nigeria when travelling across the country a few years back. 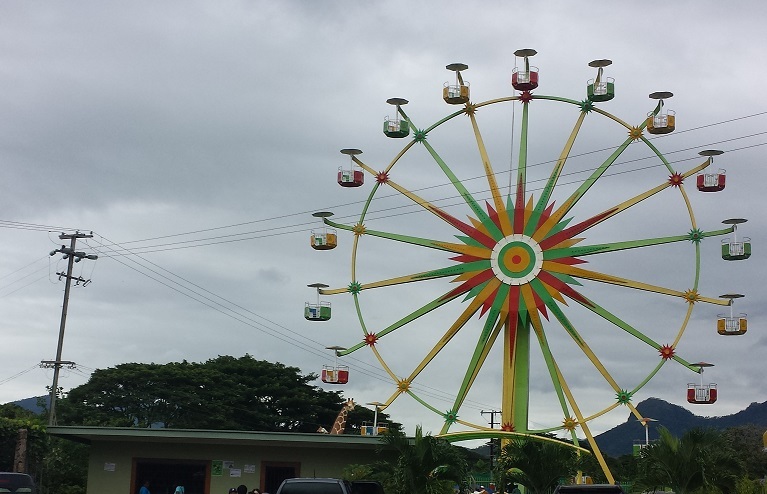 There is an adventure park next door that includes this Ferris wheel. It was built at vast expense but has never been used because nobody thought to check the regulations about proximity to power lines. If there were a storm and the lines came down, everyone in the Ferris wheel would be electrocuted. It’s very colourful though. The orchid gardens really are beautiful. A sanctuary of tranquility from the chaos of the city. The Buddhist garden is my favourite part. I think all religion is a crock but I find Buddhism to be the least crockish. I went and saw the Dalai Lama speak a few years ago and he quite impressed me. Very happy fellow. He seems to have life figured out. He doesn’t need to own anything because he is constantly ushered around and given VIP service wherever he goes. But he was quite humble and it’s the first time that I’ve heard a religious person speak the way he did. He was asked a question and his response was to refer the person to certain chapters of his book. Then he said, “But if you’re not a Buddhist, just read chapters 5 and 7. Ther’s no need to read the rest”. It was priceless. There are aviaries at the Orchid Park and they include this Bird of Paradise enclosure. 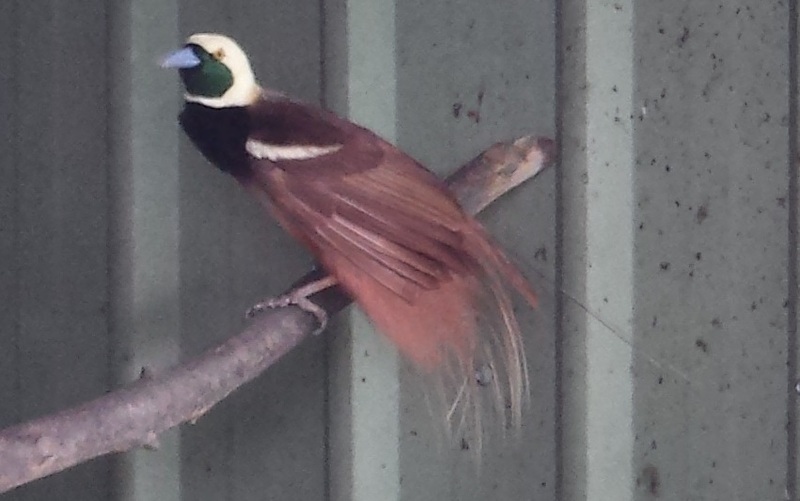 The Bird of Paradise is unique to PNG and appears on the flag. Ownership of these birds is very tightly controlled. It is illegal for a foreigner to own one. 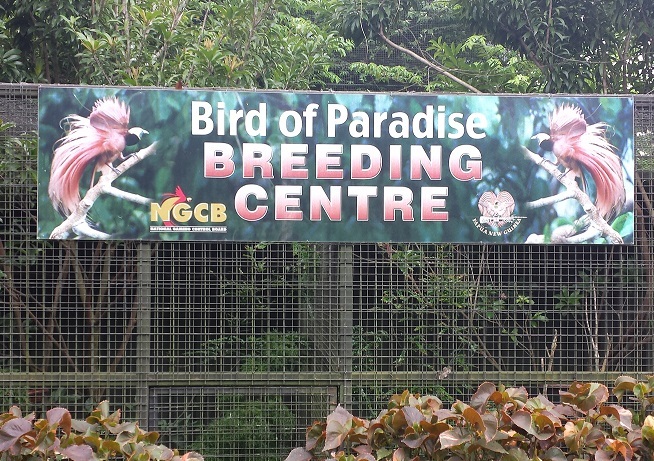 Not all of the birds in the park were as well-treated as the Birds of Paradise. 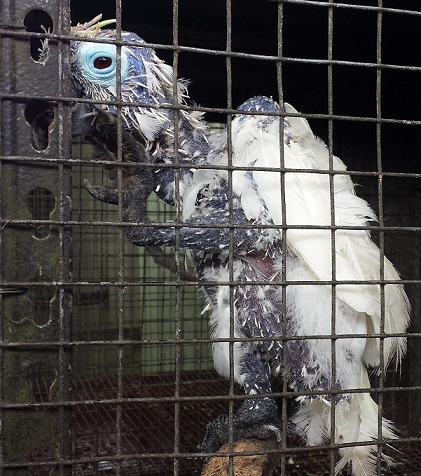 This cockatee seemed to have a condition that caused it to scratch its feathers out. I felt terribly sorry for it. 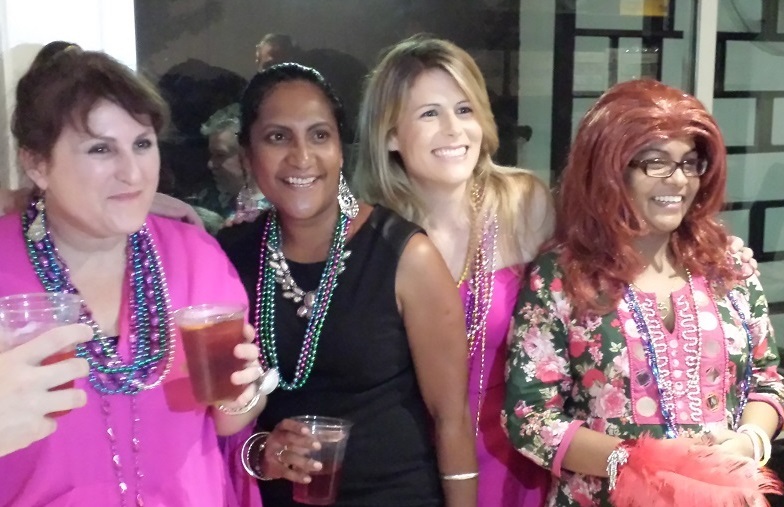 The highlight of this week was the Mardi Gras party that I attended with some American friends. In the USA and Brazil (among other places), Mardi Gras is celebrated with gusto. 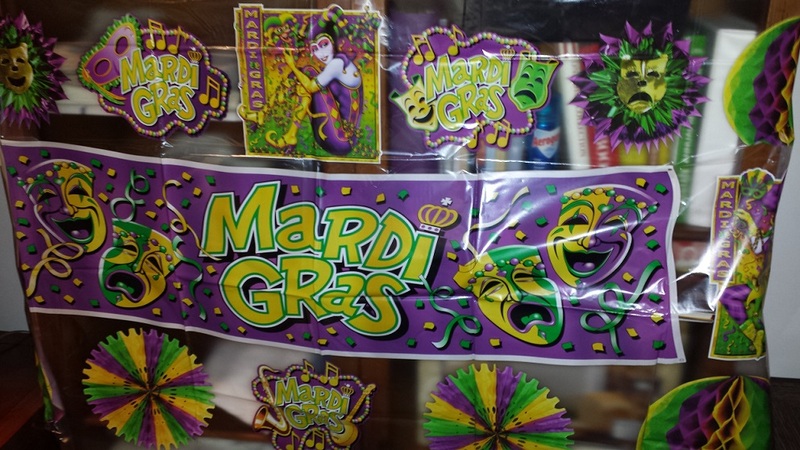 Mardi Gras means “Fat Tuesday” in French and it relates to the religious festival of Lent. For Lent, one is supposed to deprive oneself of something. So for Mardi Gras, one is supposed to cut loose in preparation for the deprivation of Lent. 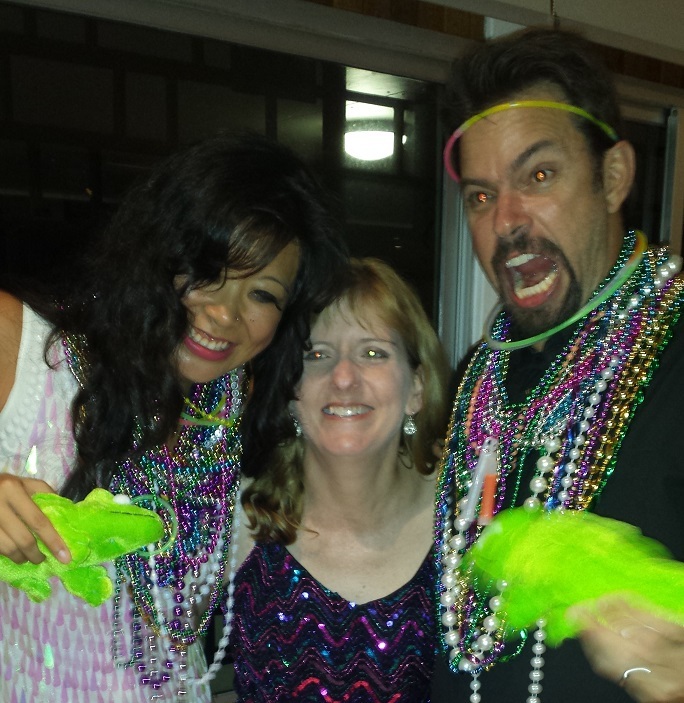 The Mardi Gras party was a lot of fun. Unlike in Australia, where Mardi Gras refers to the GLBT annual celebration, in the USA it’s just a fun party for all. 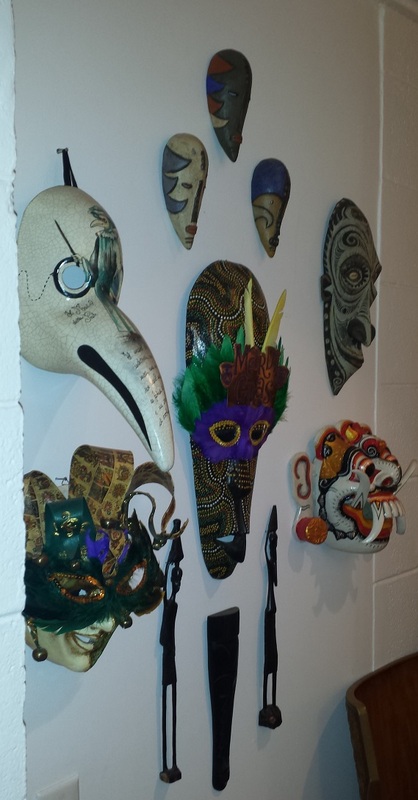 People dress up in masks and play games with beads. 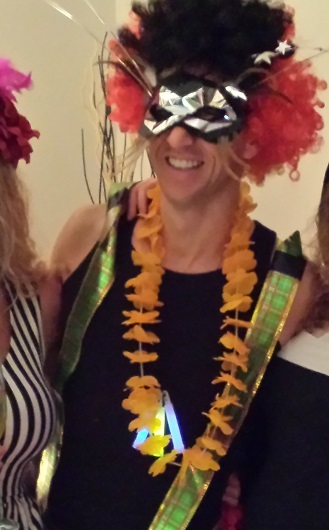 My costume featured a mask and my crazy wig from PNG Independence Day. 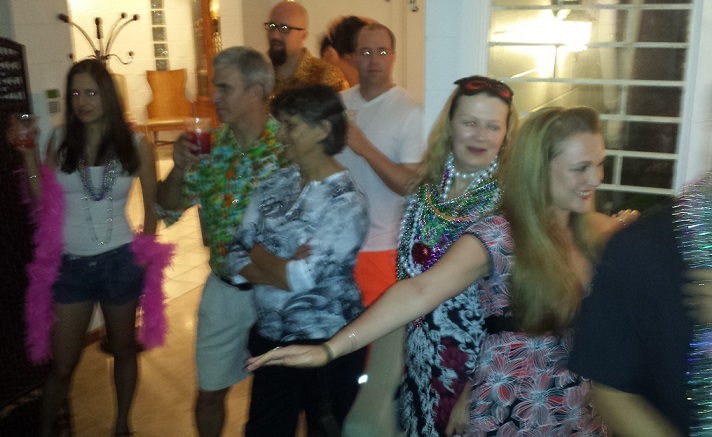 The idea of the bead game was to exchange strings of beads for getting people food and drinks. The winners received special packs of Cajun spices and such, plus these psychadelic frogs. 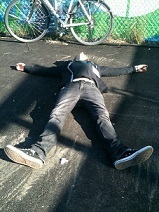 I think there may have been some alcohol involved. 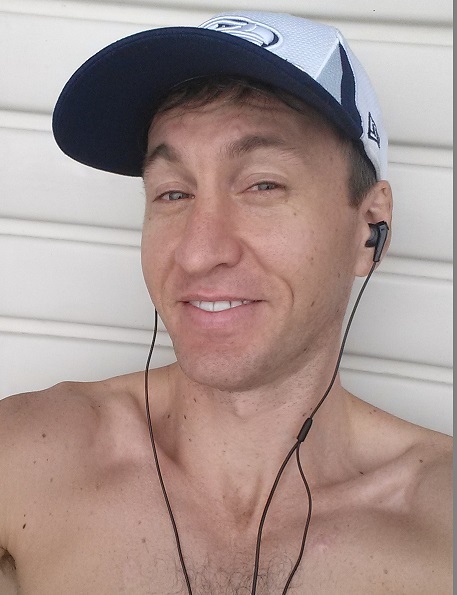 When the sun is shining, I try to make the most of it and have some time pool side. 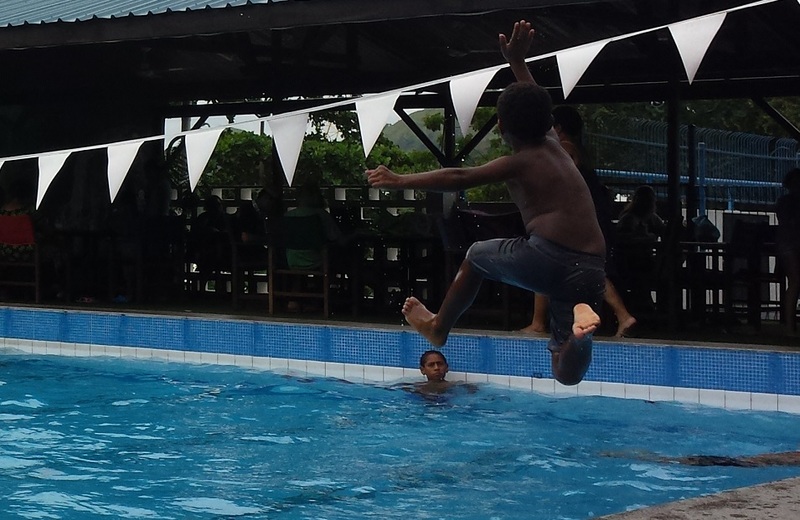 I was amused by the enthusiastic leaps into the water by some of the local children. They spend hours just running and jumping into the water – without a care in the world. Enjoying the simple pleasures of life. I wasn’t feeling terribly well last week so instead of going to the gym, I just went for a walk out by the Yacht Club. I enjoyed watching the canoes go past. I like watching the fishing boats. I grew up in the country so the sea and boating still hold some charm for me. As I was watching them, I spotted this lone paddler on the left of the photo making a break for the coast of Australia. 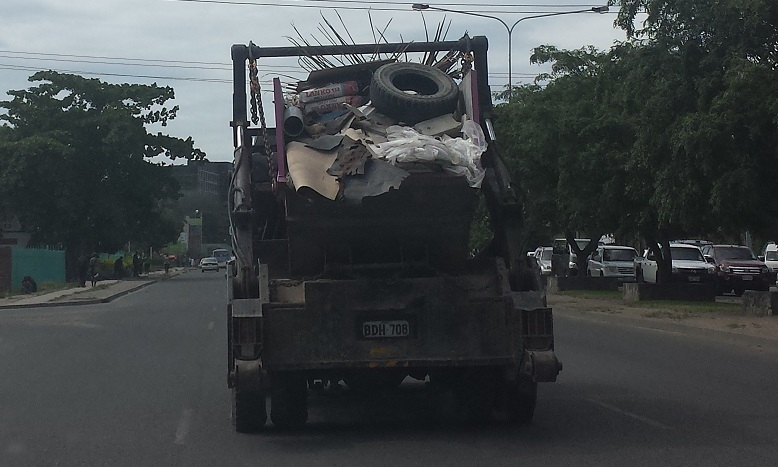 Some people will do just about anything to get out of Port Moresby.